Cool the melon, wash it and dry it. Slice the melon and remove its pits. Mix the juice of the lemon half with the brandy and pour over the melon slices. 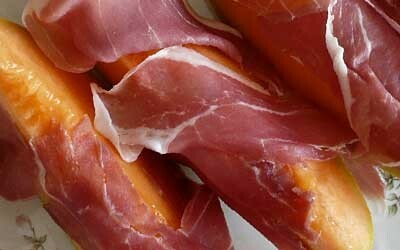 Wrap a piece of prosciutto around the melon slice and add the cooked shrimp tails on top. You can decorate the plate with fresh rucola and serve with toasted bread.